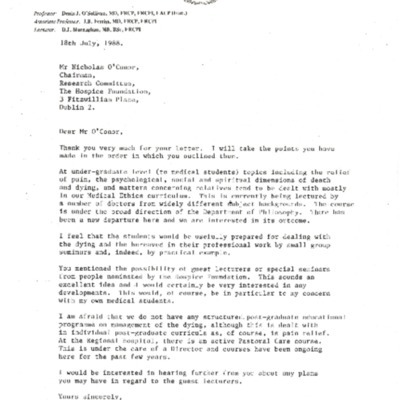 A letter from Dr. Denis O'Sullivan, professor of medicine at University College Cork, regarding the inclusion of matters of death, dying and bereavement in curricula at UCC medical school, dated July 18, 1988. Letter is in response to correspondence from Nicholas O'Conor, Chairman of the Irish Hospice Foundation Research Committee, dated July 05, 1988. Dr. Denis O'Sullivan, “Letter from Dr. Denis O'Sullivan (UCC) regarding death, dying and bereavement instruction at UCC medical school,” Archives Hospice Foundation, accessed April 21, 2019, http://archives.hospicefoundation.ie/document/1707.